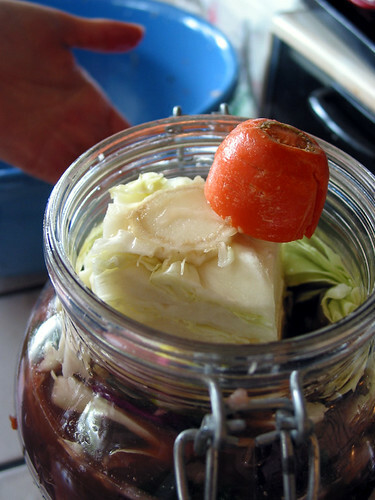 My friend and sustainable nut, Kelly, recently taught me how to make some fermented foods, sauerkraut and kvass, using the whey from cultured yogurt (Brown Cow makes quick whey if you are in a hurry). 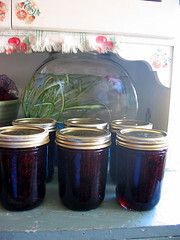 Basically a beet kvass is a slightly fermented drink made by soaking cubed beets with whey, ginger, a drop of lavender oil, and some salt — everything in a sterilized container. 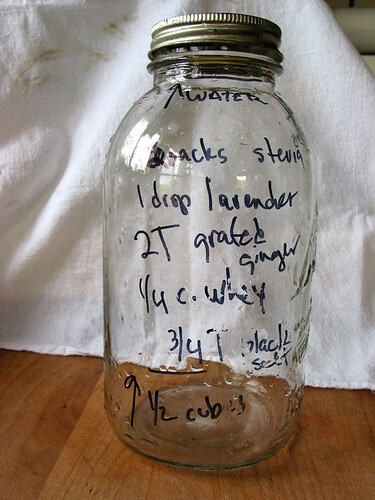 You can see how I hurriedly wrote up the recipe on the jar as Kelly was leaving. After a couple days in a dark cupboard you end up with a fairly mild, sweet and healthful drink. Apparently it's better than just juicing beets because the fermentation neutralizes the acids. Here's a similar recipe, if you're inclined. Unfortunately my kvass turned out too salty (we experimented with sulfuric Black Salt, which was a bit gnar), but the one Kelly made was dee-lish. I even liked her green drink, which was made with weeds harvested from her alley! 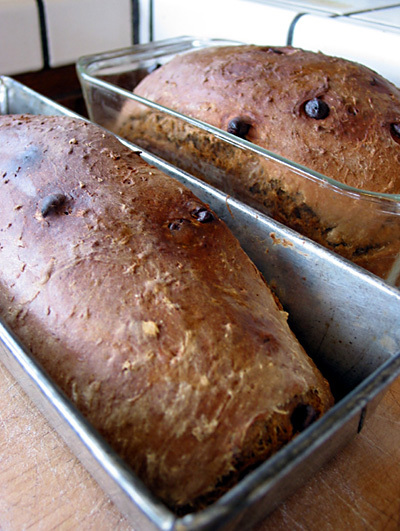 If you're local and looking to learn how to make therapeutic foods, Kelly's your gal. I'm also really excited about the kraut. We have a local, kim chee-style raw kraut that we love, but it's pricey. I'm hoping to make a homemade replacement. A couple more weeks and we get to try out the stinky goodness. 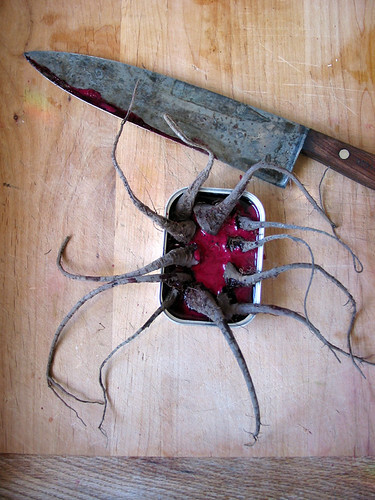 More creepy beet root pics here. *Thanks to Blaize for pointing out that this kvass is not the same as the traditional Russian drink. In our town (and several others) there's a pizza joint called, Pizza My Heart. 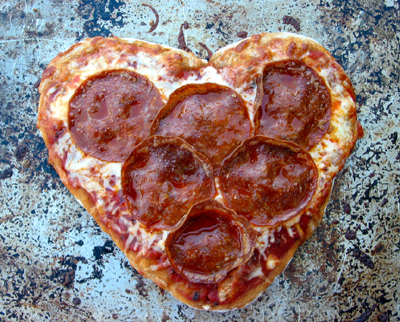 On Valentine's Day they used to make heart-shaped pizza, not sure if they still do. Even when it's round it tastes great — a definite stop-by. This one here is homemade. The dough was going in a heart-y direction, so I went with it. The makings: Trader Joe's whole wheat dough, TJ's organic pasta sauce, non-organic mozzarella, Applegate's nitrate-free pepperoni. This is one of our family's fast food compromises. Yum! Yum! And, more Yum! Fry in a little olive oil until the skin blisters. 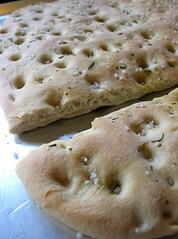 Serve on a brown paper bag with a generous amount of sea salt and large quantities of beer. Good company adds a nice touch. It's a social food, but can also turn into a bit of a frenzy. Keep on cooking. One basket is *not* enough. Don't wash them first or they'll splatter like crazy. Eat whole. Well, not the stems, silly. Even my five-year-old likes them. The two-year-old just licks the salt. My best Padrón year, ever, was when we got to house sit and tend a garden that had a row of Padróns just coming on. We ate and ate and ate that August. Read more about them here, here, or here. They're out of stock but you can get the seeds here. Or, here's a place that doesn't seem to be out of stock. Or, here. I haven't bought seeds from any of these places. If you really want to know the inside scoop on where to buy seeds, you could email my friend, Andy, who grew the peppers in this photo. I also saw that you can buy the fresh peppers here. Or, why not invest in the future and talk a local farmer to grow some. Yum! Today is the first day of the veggie box from our CSA. If you've never connected yourself to a local food grower, I highly recommend it. It's good for your tummy, the land, the farmer, the kids — and, sometimes you get to bottle feed a baby goat. One of my goals this summer is to make home-canned vegetable soup. I've had a pressure canner for years and I've always been afraid of it. I've lost the directions, so it's even scarier. It's like these. And, thanks to Julia for the photos. 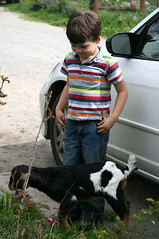 I don't get many photos of me with the kids, goat or otherwise. Two of my favorite things — yum! It was a cold rainy day here yesterday, with snow in the mountains! That only happens once or twice a year. 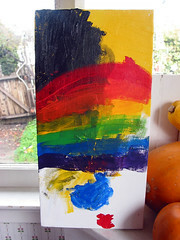 We stayed home and made bread, looked for rainbows, caught hail in our mouths, painted pictures, and watched videos. On rainy days without school, filling up the ten and a half hours that papa isn't home is always interesting (How do you do it Eren?). 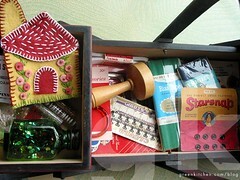 What do you do, especially when you have a little one that makes doing bigger kid things a little challenging? We have a list of things to do while he's napping, but that still leaves at least nine hours. And, someone always seems to have a bit of a cold, which makes me not want to take them out into the cold. On a different note: I love it when people share their favorite cookbooks. 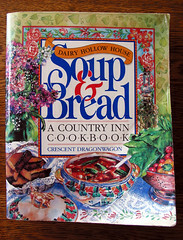 The Soup & Bread book is one of mine (Patchwork Slaw with Curried Vinaigrette; Chicken with Pasta Soup; Oatmeal Molasses Bread). I love a cookbook with prose, and Crescent Dragonwagon is a great storyteller. I love reading about the life she and her husband created at Dairy Hollow House in Eureka Springs, Arkansas. Awhile back I looked online to see if the Inn was still going and was sad to see that it is closed (now a writer's retreat) and that Crescent's husband had died — hit while bicycling. I just checked and Amazon didn't have the book. I'm sure you can find it used. 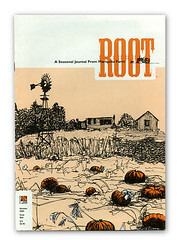 Once upon a time I worked on a very fun project, called ROOT, with my friends over at Mariquita Farm. 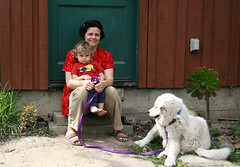 It featured Andy's writings about life as it relates to food and growing food — he's a farmer with a philosophy major. 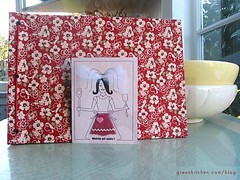 Each issue was 18 pages and included a seasonal recipe or two. I had the unique pleasure of complete artistic control; from choosing the paper (yummy French paper and a cool sparkle paper that I forget the name of), to creating the illustrations, it was all me. I also got to employ a couple friends to take photos and make images — Blaize helped edit it. We even had a testimonial from Susie Bright. ROOT fulfilled my longtime dream of collaborative creative work amongst friends. We did one issue per season for four seasons. My favorite way to use up the leftover roots from my Two Small Farms CSA box, including the ones my family doesn't like, is to dice them up small; toss them with olive oil, salt, and an herb or two; and roast them at high heat until they're caramelized bits of perfection. I think I got the idea from this book. It's a great way to get turnips and beets into people who think they don't like them. I'm horrible with laundry and/or bibs, so we have a lot of stains around here. I remember seeing a cool stain cover up over at Little Green's Flickr. 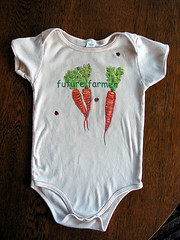 So, in anticipation of dressing my baby for today's harvest festival I did a root version of stain management. *I'm sure Julia still has copies of ROOT that she would love to sell. 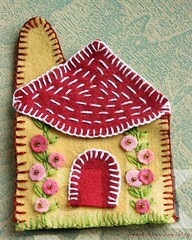 You can contact her at julia[at]mariquita[dot]com. Since we've been thinking about gnomes a lot lately, I thought I'd show you a gnome craft of yore. 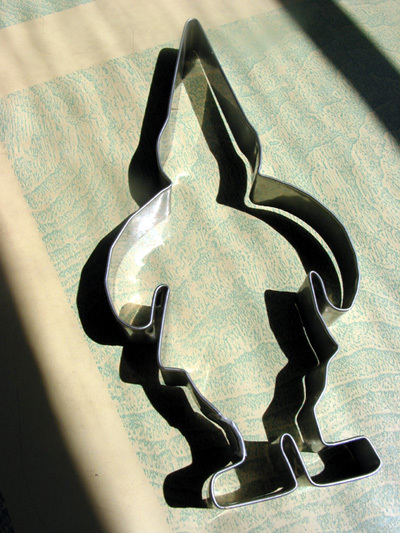 * This cookie cutter is something I did way back when I was in college — back when my dream home was a castle (got to cross that off my list a few years ago); back when I suffered the unrequited love of Zeffirelli's Romeo & Juliet on Beta, not even VHS; back when I made a yearly costumed pilgrimage to the Renaissance Faire. Man, that was a lifetime ago. 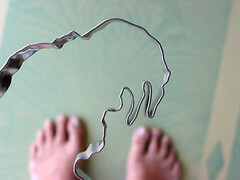 I got the idea of making cookie cutters from a woman at the Ren Faire. 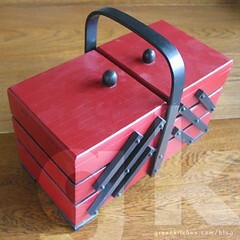 She sat on a stool with a pair of pliers, quickly bending metal into any shape of your choice. She had a book of drawings, some of them quite elaborate — I chose a cat and a dragon. Next step was to find some metal strips. I went to a local sheet metal shop and told them what I was doing. I felt a bit little-woman-ish, but the guys were pretty nice and suggested the smallest gauge metal they had on hand. I didn't have the money to special order something thinner. They cut up a bunch of strips and bent over/crimped one of the edges, so there would be the cutting edge and the pushing edge. After getting the materials it was really quite easy, sort of. 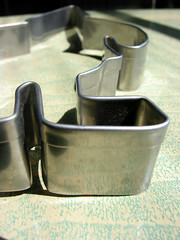 I drew an outline of the shape I wanted to make, and, with a couple pairs of needle-nose pliers, bent the metal to fit. The only difference between me and the woman at the Ren Faire was that my metal was about two times the thickness. I bullied my way through each cookie cutter and my wrists suffered for it — they haven't been the same since. Apparently, I like to suffer for my craft, because I made several gnomes as gifts, as well as, a set of Alice in Wonderland cutters for my sister, including, Tweedle Dee & Tweedle Dum and The Walrus. 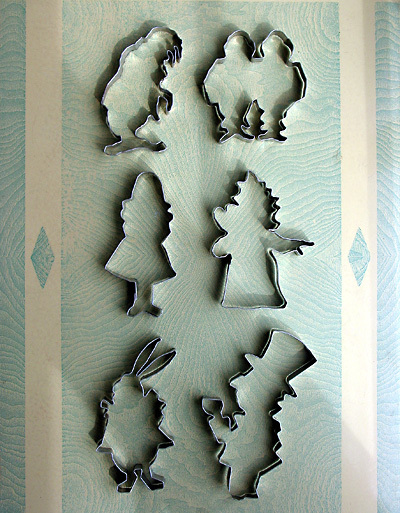 Overall, I'd say the cookie cutters were some of my more successful crafts. I still like them, we use them occasionally, and they'll last for friggin' ever. *I still forget Blaize's definition of Yore. Posole is good, real good — It will cure what ails you. 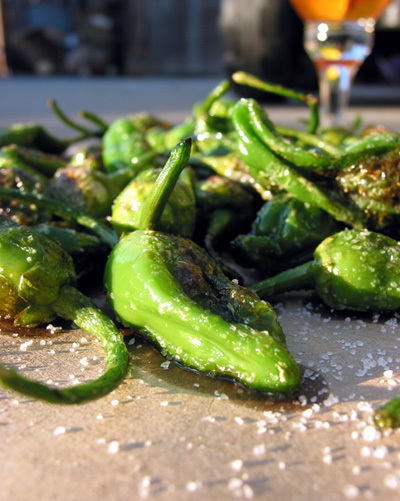 The chiles will kick a cold right out of your head and the whole mess might even get you past the wintertime blues, at least while you are eating it. I made some of this yummy Mexican soup this weekend to help get us through my son's birthday party, which included a day at the amusement park and lots of sugary treats. Posole is a comforting food, a grounding food Kids whacked out on sugar Parents chaperoning a wild kid-party need it. Now, I know you can make posole with canned hominy — I've tried this, but, it is not the same as making it from scratch. For better texture, appearance, mouth-feel, and taste you need to use the dried dent corn called maize blanco. When you buy maize blanco you also need to get some lime, not limes, but lime, called cal in Spanish — this stuff helps take the hull off of the corn. Here are some detailed instructions for cooking the corn with the lime. The way I did it was to boil a big pot of water, add three rough tablespoons of cal, stir till dissolved, add about 2 lbs of maize blanco. I boiled it until I could see the hull starting to soften and slough off. Then I dumped the corn into my sink colander and rinsed with water while stirring. The yellowish hulls wash off pretty easily. At this point you can add the corn to your soup-in-progress, but, if you want the corn to cook faster and "popcorn," or flower, then you will need to remove the little brown pointy part of the kernel, it's called de-heading. You can either pick it off with a thumbnail or slice it off with a knife. It took me about an hour and a half to do two pounds of corn with my kids "helping me." Two pounds of corn was enough to make two large pots of soup. The rest of the soup is pretty easy and there are many variations. I make it a little different each time, always with satisfying results. Here is the ingredient list from my last batch of posole. While prepping the corn get the meat cooking since it's a tough cut that needs a long, slow cooking (like two or three hours) to tenderize it. 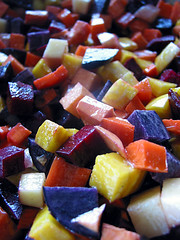 In the large soup pot start with a couple tablespoons of olive oil, adding a diced onion when the oil is hot. Cook awhile till the onions soften up, then add the pork roast cut up into large chucks, about 3 inches cubed. Brown the meat if you can, or not, either is good. Throw in some minced garlic, stir, and let it cook a couple minutes. Add a box of chicken broth and/or some water. A few bay leaves and some Mexican oregano can go in now. Heat a cast iron skillet and add the chiles turning them to warm them. I forget why I do this — I think it softens them. I didn't want too spicy a soup this time so I pulled off the stem ends and tried to remove most of the seeds. I then put about six or seven chiles into the blender with some water to make a basic chile paste. 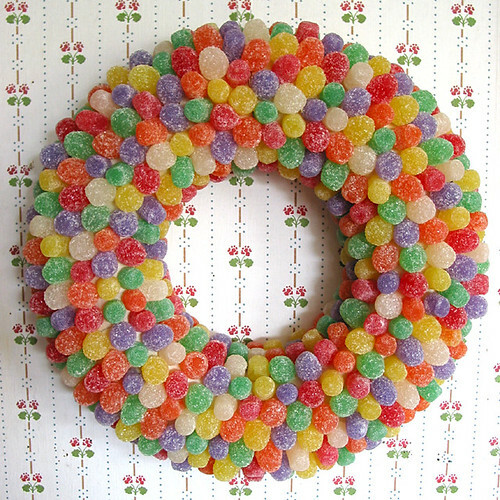 I've made more elaborate mixtures before, but this worked fine. Top with your favorite toppings from the list above. You must make your own tortilla chips to make this a truly scrumptious soup. Just cut up corn tortillas and fry them up in a pan, add salt, and then hide till dinnertime because they will get eaten up otherwise. P.S. I forgot to mention that the whole process takes a good 3 to 4 hours, but it's worth it. While you are at it you might as well make a lot and freeze some.